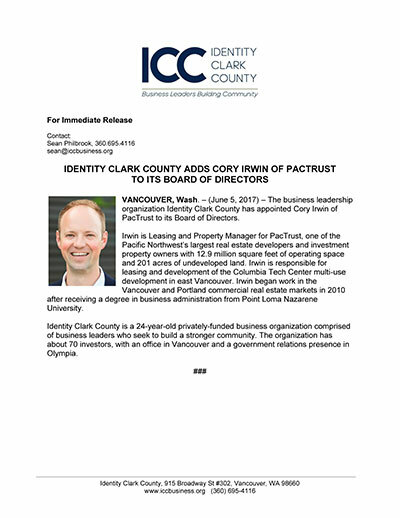 Irwin is Leasing and Property Manager for PacTrust, one of the Pacific Northwest’s largest real estate developers and investment property owners with 12.9 million square feet of operating space and 201 acres of undeveloped land. Irwin is responsible for leasing and development of the Columbia Tech Center multi-use development in east Vancouver. Irwin began work in the Vancouver and Portland commercial real estate markets in 2010 after receiving a degree in business administration from Point Loma Nazarene University.